My oldest nephew turned 18 this week! I made this lunch for him to take to school on his birthday. His school has a microwave for students to use so I put the raspberries in a silicone cup so his fruit and chocolate were easy to remove before heating. This is a big meal as I added pasta around the peppers. For a smaller appetite you can just serve in the peppers. But since I made it for a teenage boy I provided a large portion of pasta. This was my first time stuffing peppers with pasta, in the past I used rice. I had some for my dinner and enjoyed it. Also featured for the first time is my new EasyLunchBoxes Urban. These easy and convenient containers now come in three color sets: Classic, Brights, and Urban. 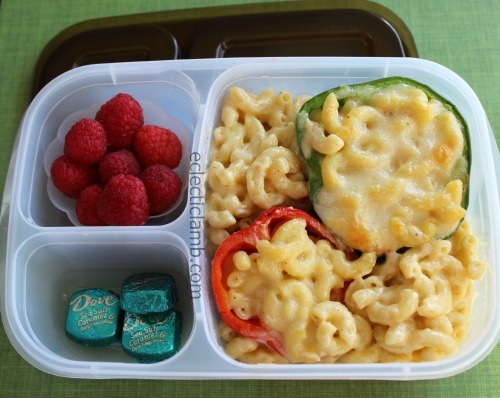 This entry was posted in Bento / Cute Food, Food and tagged pasta. Bookmark the permalink. What a great way to celebrate his birthday! I bet our nephew loved it and ate every bit of it too!! It looks delicious! Thank you! I hope that he liked it.